Don't wait to find health and happiness... Create it! Summer goes quickly, and laughter is the best medicine. If you haven't yet, I urge you stop now, and make time to play in nature and sunshine - to refresh and beautify yourself, both inside and out. Did you know that walking in the woods in sandals and barefoot in the sand, makes your ankles, knees and hips supple, sloughs years energetically and starts lightening your step in no-time? This intimate connection to the earth is integral to our health, happiness and peacefulness on subtle levels we all feel, but don’t necessarily take time to do, and can quickly forget the correlation. Laughing with old friends and sharing adventures that build new ones... Expanding beyond our usual limits through playtime and new explorations enlivens our brain as well as our hearts. It's an important aspect of sparking enthusiasm for life, and shouldn’t be underestimated for its rejuvenating powers. For me, living on Vancouver Island, it’s not too far a stretch to find outdoor fun. It sometimes strikes me that whether young or old, we’re all just a bunch of kids running from ocean to mountainside, river, lake and island with our gear and zeal to play with friends and intimately connect with the magnificent nature surrounding us. Every year, I make sure to celebrate this magical place by offering a special adventure retreat. I gather seekers of the way into enlightening lessons and activities that brighten and refresh body, mind and spirit on a cellular level, and spill over into daily life. I am careful to craft retreats that are accessible to all skill levels and adult age ranges, yet unique with a twist that always have an element of surprise. Naturally, they all include Tao Yoga, Qigong and Meditation and feature a lesson series or theme that makes the experience meaningful, unique and fun… memorable. Fortunately, (because I love doing them) over the years awareness of these outings has spread and people now travel in from all over North America and are starting to trickle in from overseas. I call them The Tao of Adventure Series. 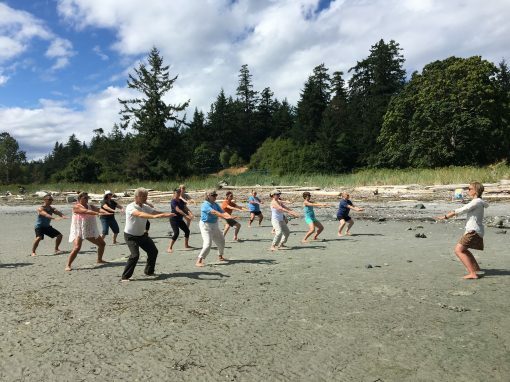 Over the past 5 years my Vancouver Island themes have included: “The Tao of the Mountain – Awakening the Healer Within” on Mt Washington, “Awakening to The Tao – Chakra Development” on Read Island and “The Mind of Tao - 12 Lesson Series” on Denman Island. Our locations are always stellar, the food is always nutritious and tasty, and we ALWAYS receive raving reviews in return. 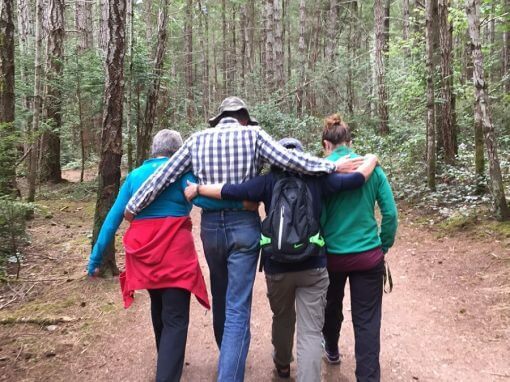 Since 2016, I have partnered with the Outdoor Education Center at Tribune Bay for “The Tao of Hornby Island Retreat” and the results are fantastic. Our programs dovetail into a perfect fit of introspection, personal growth, joyfulness and team building activities that can't be beat. The Tao of Hornby Island Retreat is a 4 day weekend that literally has it all: A great venue, hosting a wide variety of activities on water and in the woods, a fabulous location on the prime beachfront property of Hornby Island, warm-hearted, highly trained professional staff, wholesome and delicious food and draws fantastic people who gather with a common mind. Everyone is there to connect more deeply, nourish the best parts of them-selves and have a lot of fun doing it. Each day I guide morning yoga and energy meditation, afternoon qigong and an evening journey of connection. On Saturday we spend a few hours building a sacred labyrinth, which we journey that evening. 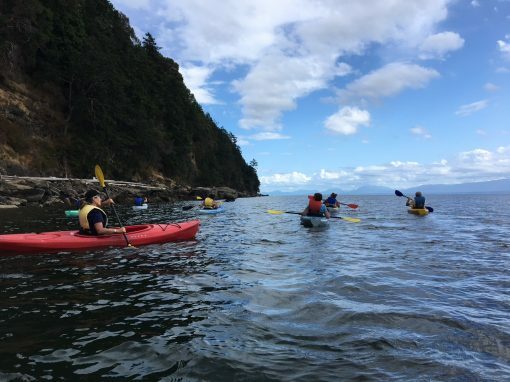 The Outdoor Education Center facilitates a wide variety of professionally guided activities for all levels and fitness conditions to select from which include; Kayaking, Paddle Boarding, Rock Wall Climbing, Hiking, Nature Walks and other Forest Games. If you aren't familiar, Hornby Island is spectacular and popular summer destination. Considered the jewel of the Georgian Strait, the Island is natural and markedly un-commercial, yet with plenty to do and a thriving Arts and Culture community. Rentals are booked years or at least many months in advance. The sacred nature of Hornby Island (see last week's blog on that topic) is well mapped with petroglyphs and First Nations lore. Our prime beachfront location on Tribune Bay is perfect for lounging on the sand, collecting sand dollars and swimming. The unusual "moonscape" waterfront features that line the coast provide hours of fascinating exploration. The ancient cedar forests are magical and make great environments for exploring, meditation, collecting wild medicines and traversing the island on foot or by bicycle etc. The Crafters Market is a wonderful way to spend a few hours through the day checking out the vibrant art scene and local veggies, fruits, herbs and jams. It’s always a wonderful experience for me seeing people I trained years ago coming together with my current students and meeting many new faces. People join in from all skill levels and walks of life, everyone is able to engage fully and have the time of their lives. Are you feeling ready to sparkle with JOY this summer? Would you like to read more about this or other topics? I'm listening... Submit your opinions and comments or ask your questions below.